Armageddon in Northern California, Puerto Rico in ruins, Alabama coastline destroyed, while the Trump administration seeks to slash fossil fuel regulation. Posted on October 10, 2017 by Al B. 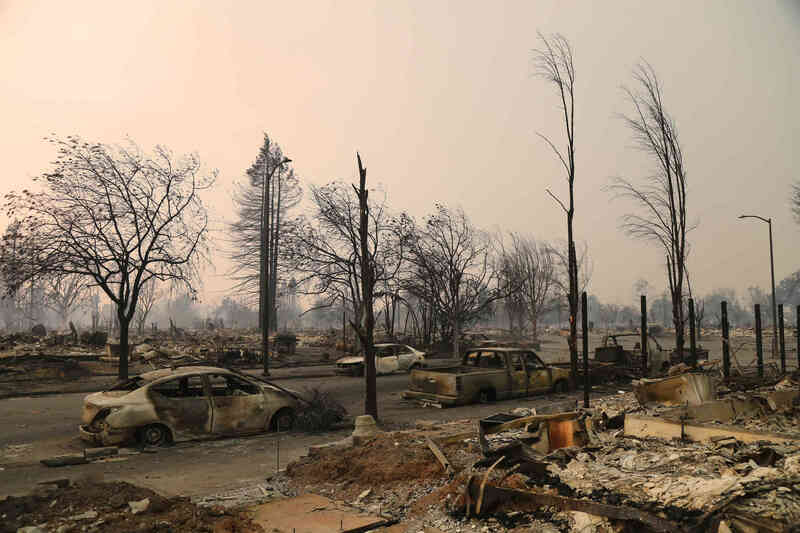 The scenes from Santa Rosa are like the end of the world. In late August I ate at Phyllis’ Giant Burgers exactly where this fire wiped out hundreds of homes. This scene is just a few blocks north of the area I ate in. The death toll is still unknown since the fire arrived at night. Hundreds are still unaccounted for. As the New York Times reports: About 115,000 acres had burned by Tuesday afternoon, destroying about 2,000 structures and forcing the evacuation of more than 20,000 people, officials said. Back in early September, I drove over the hill east through the tinder dry hills in 105 degree heat. It was very unnerving even then, as the temperature climbed and climbed as I drove up into the hills and over the pass. Past the Hilton. Now, it’s all gone. By the time I reached the Central Valley and I5 it was over 110. I texted my wife each time the temperature notched higher. 110, 111, up to 115. I hoped my van didn’t break down in the heat. This is California today. On fire. While we were losing much of a city of 100k the Trump administration decided it a perfect time to propose to scrap the EPAs Obama-era plan to reduce greenhouse gas emissions from power plants. This is the world we were warned was coming. We are here, now. It’s too late to turn back, or fix the planet. We now just have to deal with it. Because our political leaders and most of us, never had the courage to do what was needed. We have an incompetent lunatic in the White House and people bent on destroying our planet for their own gain. And the Democrats still haven’t called for impeachment. Come on folks, do something. Now.